Originally we thought we would have to return to Ho Chi Minh City to take a bus to Phnom Penh, but after doing some research we learned the border in Ha Tien was open to foreigners. This was perfect for us since we wanted to visit Kep first in Cambodia and not have to backtrack to HCMC or Phnom Penh. Getting there from Can Tho was quite the adventure…. Our recommended visa agency for Vietnam. 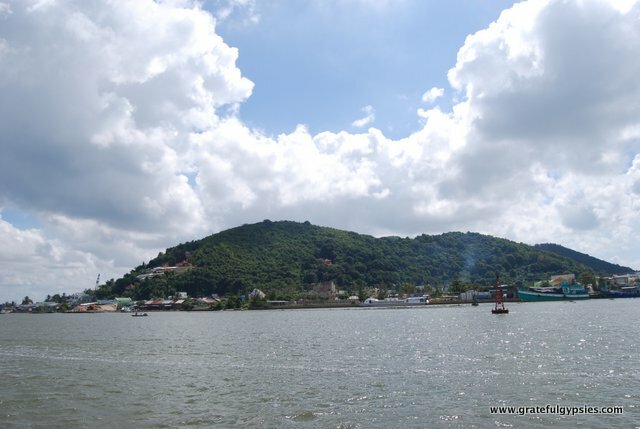 There’s no direct way to get to Ha Tien from Can Tho since it’s not a popular destination. Our research had led us to believe that we would have to first buy a bus ticket to Rach Gia and then get another bus to Ha Tien from there, but Mr. Hung told us there was one direct bus leaving at 10am. When it was time to go, however, he was nowhere to be found. We were able to communicate to the nice ladies working in the kitchen that we had to go so they put us and our big backpacks on their motorbikes and zipped us to the bus station. 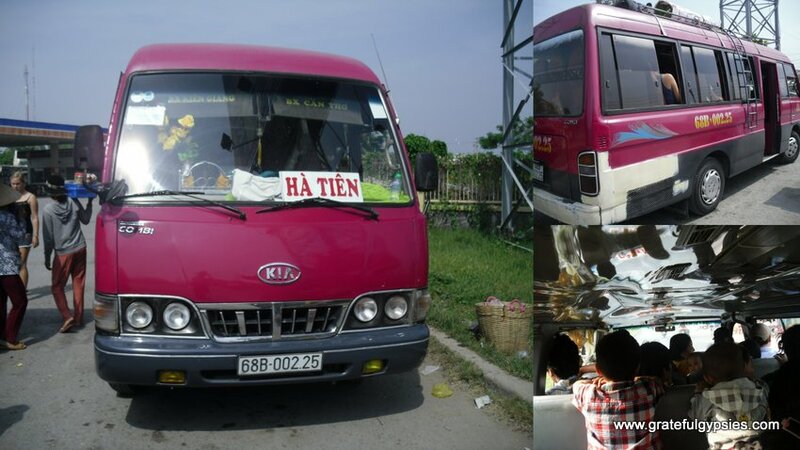 We found a mini-bus with a Ha Tien sign in the window and bought our tickets. 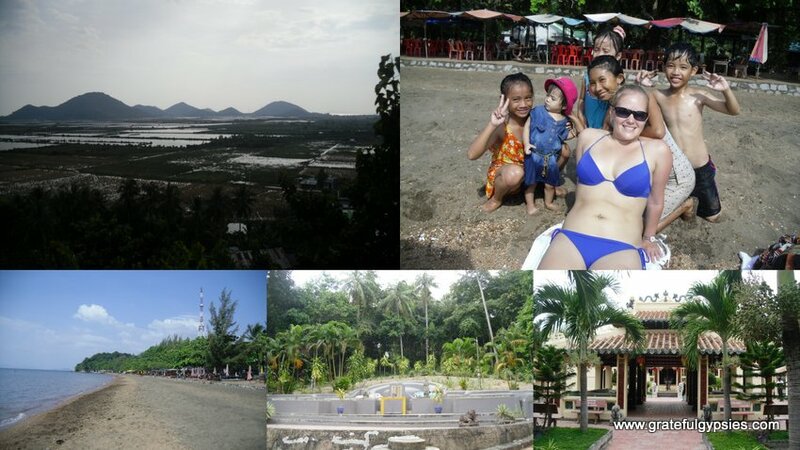 Our long, strange journey to Ha Tien. The bus station was chaos with buses blaring their horns and vendors walking around trying desperately to sell anything from tissues to baguettes. It was quite the scene. Finally after sitting and waiting for two hours the bus was full and we left. It felt like we’d been driving forever when we finally stopped and everyone was made to get off. We were in Rach Gia. It turns out there’s no direct bus to Ha Tien, but rather than having to find another bus station and buy another ticket, a lady from the first mini-bus ride who apparently worked for that bus company became our ‘babysitter.’ She communicated with body language for us to sit down and wait. We were able to enjoy a delicious street food snack and find a toilet. Finally a mini van pulled up and we were crammed inside with about 15 locals and we were off again. After about five hours, we finally arrived in Ha Tien. Most people only come here to cross the border or get a boat to Phu Quoc island. They don’t spend more than a few hours in the city. We still had two days on our visas and we were exhausted having just come from Sapa in the far north in less than a month without taking a single flight. So we decided to relax in the seaside town for two days. We had read that the Hai Yen hotel was the best value for money and it was true. 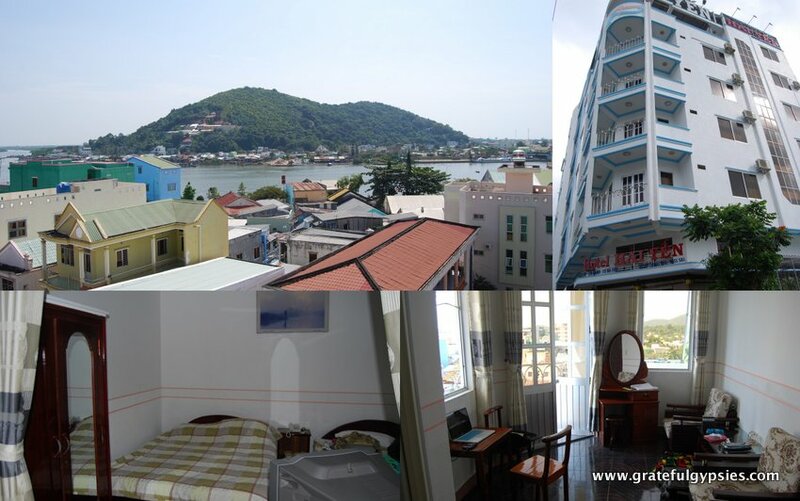 For 250,000 VND (roughly $12) we had a huge room with two double beds, a living room and a balcony. Our superior room at the Hai Yen hotel. After checking in we went for a walk and had some delicious seafood pho for dinner. The next morning the power was out and it was hot. We really wanted to go swimming. After a bit of trouble and frustration we finally agreed on a price for a day tour with some motorbike drivers. Our first stop was Mui Nai beach where we relaxed and had a photo shoot with some locals. I guess they don’t see too many foreigners on that beach. Next we went to a cave in a mountain known as the ‘face cave’ because the rocks on the outside resemble a human face. Our last stop was a temple and a tomb for a man who was very important to the area and his family. We spent the rest of the afternoon relaxing on our balcony. Scenes from our day trip. 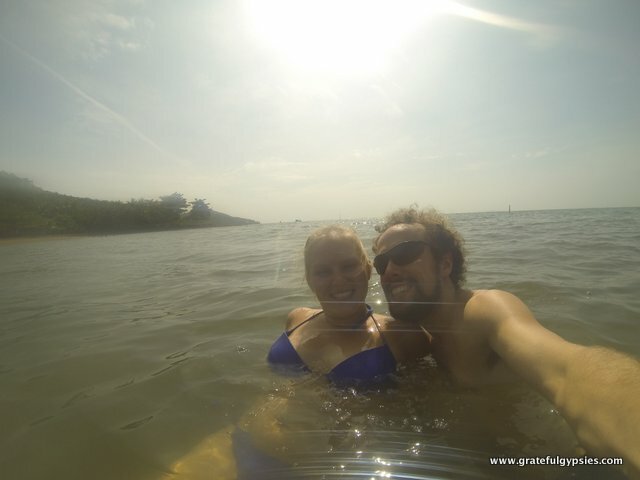 Selfie in the water! First beach of the trip!! There’s plenty of cheap local fare in Ha Tien like standard rice and noodle dishes. We particularly enjoyed the seafood pho. Oasis is the only place in town with western fare, cocktails and super cold, cheap beers. We enjoyed the food so much we went there twice. They have a specials menu every day based on what’s available at the local market. Couscous with vegetables and creamy lentil soup were the specials on hand during our visit. The full English breakfast was equally delicious. There’s a travel agency that operates out of the restaurant that can book onward travel and arrange the visa for Cambodia. We arranged for a mini van to take us all the way from Ha Tien to Kep. The journey was only $12 each. The same travel agency also arranged our Cambodian visas for $27. The official price for the visa is $20 but the officials at this crossing are corrupt and make you pay $25. We figured the extra $2 was worth not having to deal with the hassle ourselves. It also made the process much faster. When we arrived at the border, the Vietnam side was quite simple and we were given our exit stamps no problem. Then the van drove us through no-man’s land to the Cambodian side. The only sign of life in this corner of Cambodia are the handful of casinos, geared towards Vietnamese who flock here due to the illegality of gambling in their country. We had to sign a few papers, including a health questionnaire with a subsequent ‘health check’ where all the official did was take our temperatures. We all had to pay $1 for this. There were two people in the group who opted to do the whole process themselves and tried to refuse paying the health ‘fee.’ In the end we were all yelling at them to pay the fee and get in the van as it was so hot outside. They finally paid and we were on our way to Kep. Our time in our first country of traveling had come to an end. Crossing from Vietnam into Cambodia. Transportation: We arrived in Ha Tien from Can Tho by motorbike, bus, mini van, and one more motorbike. It was an arduous journey that took the entire day and about $20 total. Accommodation: For just $12, we had a huge room on the top floor of the Hai Yen hotel – two double beds, en suite, living room w/ fridge, and a nice balcony. We’re pretty sure we were the only people in the hotel during our stay. Getting Around: For our day trip, we paid two motorbike drivers $10 each to take us to the beach, the “face cave” and a temple. You can easily walk around the little town as well. Activities: Head to the beach, which isn’t impressive but is a nice respite from the heat. There are some caves and temples to check out as well. Food/Drink: Plenty of cheap local fare, including some delicious seafood pho are readily available. 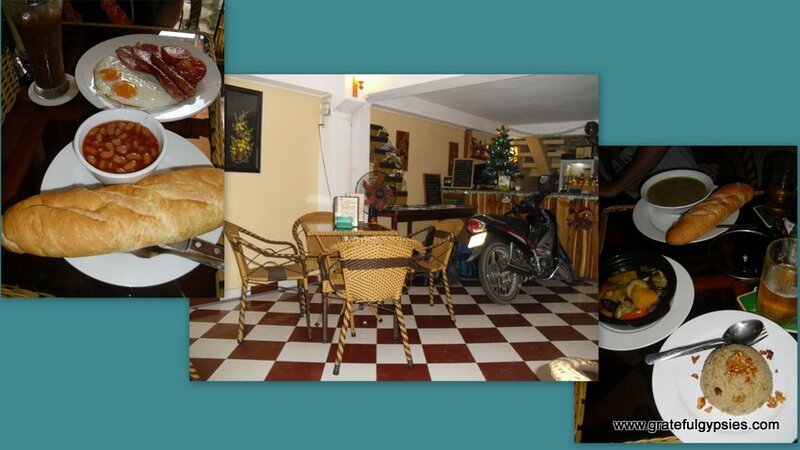 For western food and cocktails, Oasis is the only place in town. Recommended Time: While most just blow through here on their way in or out of Vietnam, we feel like it’s worth spending at least a day here. Total Cost: We spent a total of $110 for our two days in Ha Tien. This does not include our Cambodia visas ($27 each), which we have included in our Cambodia budget. The Cambodian Border Officials ONLY COLLECT USD$20, They have very tight security with two cameras overlooking the officials which is on an InterNet stream to Phnom Penh. The crooks are in the Travel Agency you used. The only additional fee is a USD$1 charge. Don’t be so lazy. YOU were at fault for not getting a Visa at the border: I know this crossing intimately, I am there every month and I know the staffs on both sides of the border well. The Vietnamese Border Gate is supervised by a man who is very strict on his staff and I know he has fired staff who took ‘tips’. So before accusing people of fraud, know who you should point the accusing finger at – and that is the travel industry in Ha Tien. Hi, Johnson. Thanks for reading the post! We did this border crossing in 2013. At that time, corruption was a problem at the border. 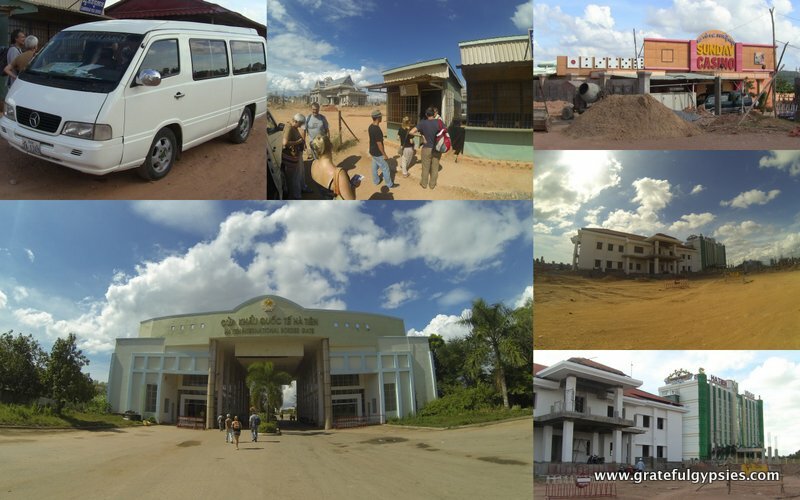 It wasn’t only Cambodian officials, we were also hassled by Laotian officials when we did that border crossing. We heard stories from other travelers about it happening to them and even a long time expat living in Ha Tien told us the same thing. In fact, there was even a mention of it in Lonely Planet. We rarely use travel agents as we prefer to do things ourselves. However, for this particular crossing, it made more sense to go through the agent based on what we had heard and read on other travel blogs. I’m happy to hear that things have changed. I hope they continue to improve so future travelers have a less stressful experience crossing the border by land. I just traveled the same route recently, but instead of going to Kep it headed directly to Kampot. After reading so much negative things on the internet about crossing the Cambodian border overland I was quite happy to find your article. If you’re interested in how my trip over the border was, make sure to check out my post about traveling from Saigon through the Mekong Delta to Kampot. Thanks a lot and keep up your great work!! Hey Niko! Thanks for the comment. 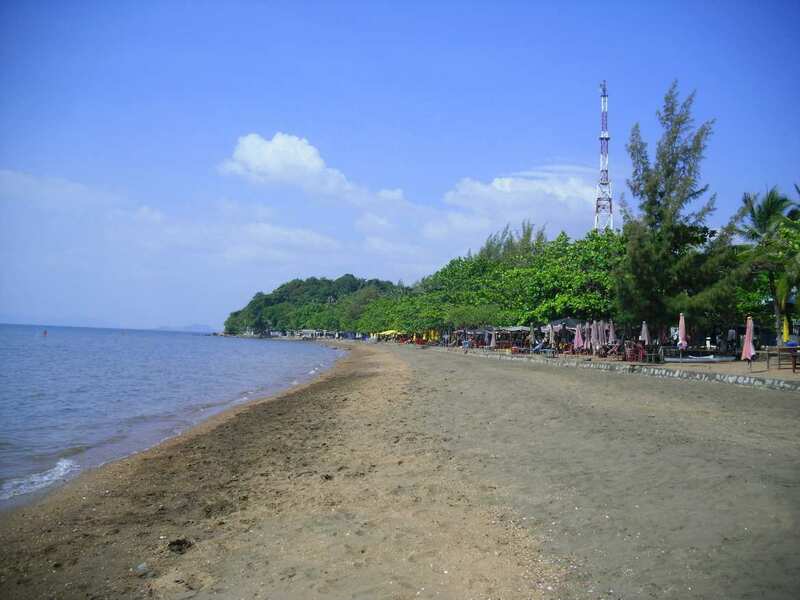 We booked our trip through a travel agent in Ha Tien to make sure we could go to Kep. We went with one of their drivers in a small mini van. We didn’t take the public bus. We also paid an extra $2 to have them handle our Cambodian visas so as to not deal with the corrupt border officials. I unfortunately had the worst stomach ache of my life and was worried about having an attack at the border. Luckily that didn’t happen! I had a look at your post and really enjoyed reading your story! Perhaps our paths will cross someday. Looking forward to reading more posts from you! Awesome! Thanks guys. We’re planning on doing a similar trip but in reverse. Siem Reap – Phnom Penh – Kep – HCMC so this was very helpful and maybe we’ll spend some time in Ha Tien before traveling onward. I love your article it’s really informative and making me so look forward to my trip to Vietnam. I’m planning on crossing the border at the same border crossing as you guys and was wondering how you arranged to get a minivan to take you to Kep. is it something that can be done easily or does it take time to arrange. with my itinerary I’ll have about a day in Ha Tein to arrange onward travel to Cambodia. do you know if there’s any other options of getting there? Thanks for the comment, Elsie. When you’re in Ha Tien, just look for a little tourist information shop. The town is really small so it’s hard to miss. They can get you on a minivan to cross the border and can even arrange the visa for you for an extra $2. It’s not that it’s hard to do the visa yourself, but in our experience we found that it’s usually better to not have to deal with the corrupt border officials yourself in this part of the world. They make me crazy and I’m happy to pay a few dollars not to have to deal with them! As far as other options, you could also ride on the back of a motorbike. It may save you a few bucks but would probably be very hot and uncomfortable. Best just so stick with the minivan. Enjoy your trip and let us know if you have any other questions about Vietnam or Cambodia!